In this post: Several Dragon/Dinosaur themed food and fun in this post redo. Toddler fun, Jurassic World parties, Pete’s Dragon, and a Creation themes! Hello, Dear Ones! I hope you are well. Remember last year I lost about 3 months of posts because of host issues? Well, because of this I am redoing my dragon post from last year. Thankfully I have all of the pictures. I’m not writing as much as I did in the original post because honestly, I don’t remember what I said. Still, I have the pictures and links with a brief description. I believe you will still be inspired. Enjoy! When Dragons’ Hearts Were Good Book- The kids listened to the cd while looking at the pictures. This is an excellent book to teach the Creationist and Biblical view. I strongly encourage you to check out this book. It is awesome! Dinosaur/Dragon Creation Poster Board- Michael, Chris, and I made this poster of dinosaurs in the Garden of Eden with Adam. Leeland added the stickers. We believe (like other Creationists) that dragons were dinosaurs. Danny the Dinosaur- Did Dinosaurs/Dragons go on the ark? Another book from the Creationist/Biblical view. Celebrating Firefox/Honoring his Memory- Our first bearded dragon, Firefox, sadly died because he stopped eating. We were so sad but at least we had some nice memories…like pictures from Dragon Day. Firefox helping Michael do his math. Jurassic World Theme- How we celebrated in 2016. Michael was allowed to watch parts of Jurassic World and we used that theme. Leeland enjoyed playing with dinos and hearing stories. Enjoy! Michael working on a dino footprint, egg, and dragon glider. Melina’s Jurassic World Party- Our dear friend had a dinosaur party for her little girl. This was in June and a pool party. It is a perfect theme for Dragon Day. Melina did an amazing job. Enjoy! 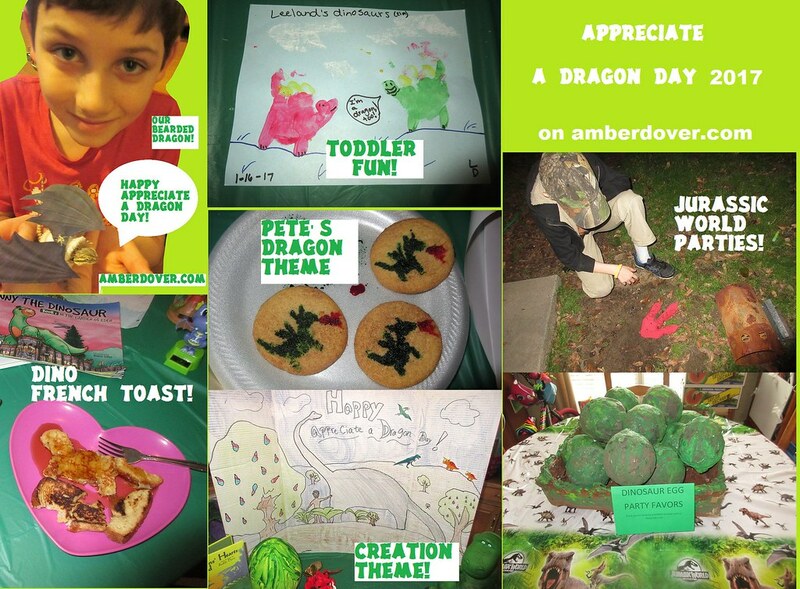 How to Train Your Dragon: Dragon Day 2015- Check out our party from 2015. We’ve got great treats, games, and even costumes!